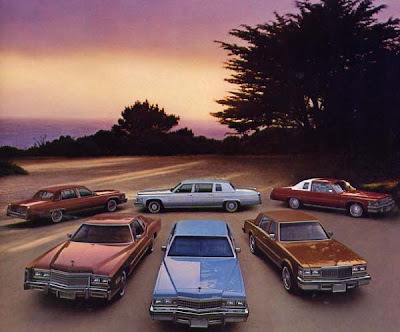 The Cadillac family snapshot in 1978: (back row, left to right) Fleetwood Brougham, Cadillac Limousine, Coupe deVille and (front row, left to right) Eldorado, Sedan deVille and Seville. 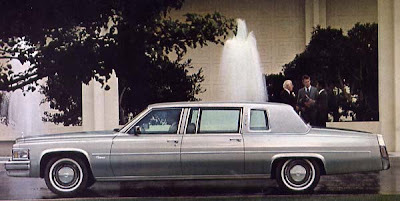 General Motors’ "Standard of the World" was offered in Deville, Brougham, Eldorado and Seville forms as well as Limousines for the 1978 model year. None were new but the lily was carefully gilded, making each finer than ever before. The advertising pitch for the selling season was subtle and to the point. 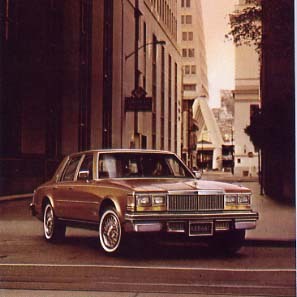 “Behind the great name…great cars.” Smaller, more efficient machines was the name of the game in the late 1970s throughout the automotive industry and engineers at Cadillac did their utmost to be at the forefront--thus setting the North American benchmark--in the European inspired downsizing trend. 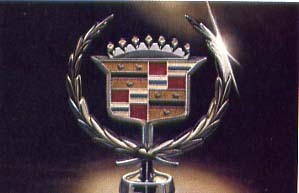 The Cadillac symbol had stood for excellence since the marque bowed in 1903. Riding a midsized, 2093-millimetre (114.3-inch) wheelbase and now in its third year on the market, Seville was the most petite member of the Cadillac clan. Introduced in the marque’s 75th anniversary year, changes in the “timeless design” were minor, though one could now order the “brilliant” road car with imported classic wire wheels or locking wire wheel discs. Elegance was spoken throughout, from the choice of ten colours of Sierra Grain leather to the Signal Seeking Stereo Radio with Scanner and Disappearing Power Antenna, to the Tuxedo Grain vinyl roof, all of which were standard equipment. Seville was the model given the nod to make history by being the first Cadillac to have a diesel engine as optional equipment. The regular 5.7-litre, gasoline-powered mill offered more than ample power for Seville. Eldorado appeared in this envelope for the last time in 1978. Eldorado, the personal Cadillac with front-wheel drive, had not seen a major restyle since 1972. 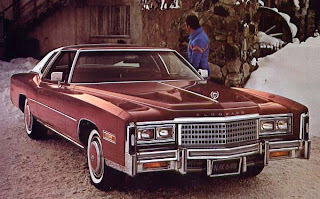 This year an Electronic Level Control was offered on all Cadillacs and Eldorado was no exception. The mechanism sensed automatically the weight of the load carried and adjusted to it. The marque’s magnificent personal machine could be fitted with every imaginable creature comfort and offered seating in four hues of Halifax, “a tasteful knit” cloth, three casual colour choices in Random Velour or a dozen colours of supple Sierra Grain leather, including two-tone combos that were available with the extra cost, individually adjusting Dual Comfort front seats. The Eldorado Barritz came with distinctive nameplates, a choice of five special paint jobs and colour-coordinated wheel discs. The Barritz Classic went a step further offering tasteful two-tone paint schemes. upholstered in Light Grey Florentine Velour. Coupe deVilles and Sedan deVilles were equally opulent. The automatic Climate Control, automatic transmission, the Electronic level Control Power Steering, Power for the four disc brakes, steel-belted wide-whitewall radial tires, The AM-FM Signal-Seeker Radio and Scanner with Automatic Power Antenna, the Six-way Power Seat Adjuster (driver’s side), the Dual Comfort 50/50 split-bench seats, a choice of 13 colours for the accent stripe, a High-Energy Ignition System that eliminated points, condenser cam and rubbing block, Soft Ray Glass, Three-Speed windshield wipers and washers with a “Mist” position, Quartz Digital Clock, Trip Odometer, a Colour-Keyed Litter Container,, Remote Control Left-Side Mirror, an indicator light for windshield washer fluid level, Centre Armrests and the Sunshade Vanity Mirror made these models truly sumptuous. Sedan deVille and Coupe deVille cabins were decked out in Hampton Woven Cloth as the base interior but upgrades to Random Velour in nine rich colours or ten shades of leather were also available. The 1978 full-sized Cadillac instrument panel placed all driver controls to the left and passenger-shared controls in the centre. An Information Band ran across the top to advise the driver of important functions. For the truly discriminating, there were special editions. 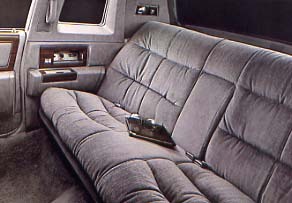 The deVille d’Elegance featured special script, “pillow style” seating in four shades of Random Velour on the 50-50 split bench seats, all set off by high pile shag carpeting. Thoughtful touches included three roof-mounted passenger assist straps and door pulls. The Brougham d’Elegance was dressed in Florentine Velour, the owner choosing among Antique Light Grey, Antique light Blue, Antique Dark Green, Antique Light Beige and Antique Dark Mulberry for seats and door panels. If those upholstery choices weren’t suitable there was always the Medium Saddle Leather for the seats. 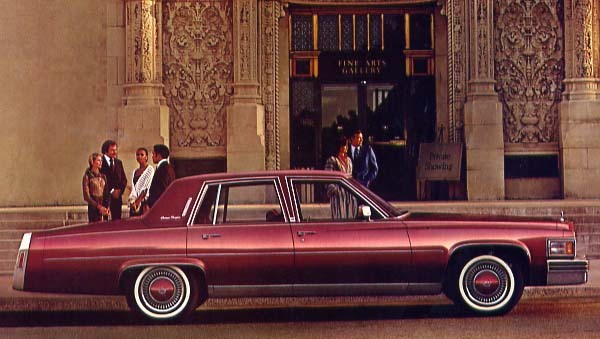 This edition of the Brougham was given accent stripes and special turbine-vaned wheel discs if one desired. The Cabriolet carried a cunning roof treatment in which the rear window was set off in any of sixteen colours on handsome Elk Grain Vinyl, finished in a French Seam around the rear window and finally kissed with distinguished crests. Elegance personified the formal Fleetwood Brougham. Opera lights were standard on the Brougham. Last but by no means least were the Fleetwood and Fleetwood Formal Limousines. These highly esteemed hallmarks of prestige were long the world’s benchmark for those who required the relaxed, luxurious world of privacy. Interiors were finished in Black Leather seating up front while the passengers sat on upholstered seats in a rich Light Grey, Black or Dark Blue Florentine Velour. Jump seats were part of the package. (144-inch) wheelbase and weighed in at 2165 kilos (4,772 pounds). The full-sized Cadillacs tooled around town effortlessly courtesy of a 7-litre, V-8 engine, all mated to the 400 Series three-speed automatic transmission. Non-leaded gasoline was the fuel of choice. The Broughams, deVilles and Limousines came with an enormous 96-litre fuel tank. The elegant Eldorado boasted an even larger 102-litre gas tank and the seductive Seville’s tank held 79 litres of gasoline. One could never have too much luxury. Cadillac offered as many glittering options as there are there are diamonds at Birk’s. Some of the more popular add ons included the Tilt and Telescoping Wheel, the SunRoof or AstroRoof, Tape Player with Citizens’ Band Radio, padded Elk Grain roof tops in sixteen colours, Cruise Control, the Theft-Deterrent System, an Automatic Door Lock System, Illuminated Entry, a colour-coded Fuel Monitor System, Power Reclining Seats, Rear Window Defogger, a Heavy-Duty Handling Package and a Power Trunk Lock. 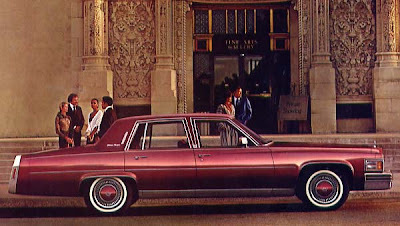 Cadillac ranked 40 among the more than 80 brands and nameplates offered domestically in calendar year 1978. A total of 8,234 of the luxurious cars were purchased good folks from St. John's to Victoria. . Cadillac's competition in Oakville did well that year, too. The Lincoln Continental ranked 49th with 7,026 sales and the compact Lincoln Versailles accounted for another 295 sales.